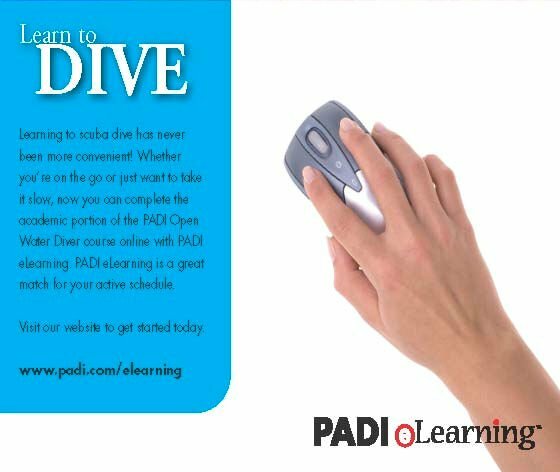 E Learning is a great way to complete your theory side of the Open water diver course which will leave you with more time to Dive and concentrate on the Practical side of the course. This can be completed in your home via the internet in your own time whether you have a spare hour or several. Once the theory is completed in your own time and your own home and your exam passed you will be given a results and completion sheet to print off, sign and bring with you to Adventure Divers. This way of learning theory ensures you have to time to relax after a day of practical training at our PADI dive center instead of worrying about completing the theory in the evenings after the course. The open water diver e learning course takes approximately 8 to 10 hours study. For taking the e learning theory course we deduct 130 € from the cost of the Full Open water diver course . Please CLICK HERE to book your theory course online!